Known as Little Sodom in its day, Cole’s Bad Tavern and the Cole Cemetery nearby sit in serious danger today. The encroaching development could trigger their disappearance. Thanks to the present owners Jim and Mary Nuckols, and Jim being a Cole descendant, efforts have begun to help the two historic sites ensure preservation and escape extinction. Future preservation begins here, adding new research to what has been written before about the tavern, about the inn, and about the cemetery. The two historic sites reside on land once settled by Richard James Cole and Anne Hubbard, the second great-grandparents of Frank and Jesse James. Migrating first from Pennsylvania to Culpeper County, Virginia, the couple moved next into the Kentucky District of Virginia in 1787. The District was America’s westernmost frontier. Kentucky was not yet an independent Commonwealth. They followed the prior mass exodus from Virginia of the rebel Baptist preachers of the Traveling Church and their congregations. Between 1782 and 1784, the Traveling Church brought thousands of pioneers into the wilderness frontier. 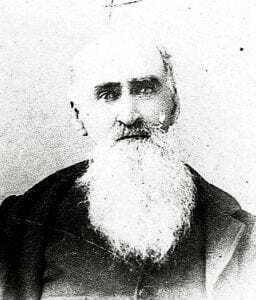 John M. James, believed to be the grandfather of Frank and Jesse James, was one of the Traveling Church exodus. He arrived in Kentucky five years prior to the Cole family. Unlike the Traveling Church that led John M. James into Kentucky, Maj. John Hancock Lee (1742-1802) led Richard James and Anne Hubbard-Cole in their migration to their new home in the Cain-tuc. The Coles formerly executed a leasehold in Virginia with Maj. Lee’s father, Capt. Hancock Lee (1709-1765) who was married to Mary Willis. The leasehold was a farm of 150 acres on Horsepen Run in King George County. The term of the lease was for life. Whether the leasehold was abandoned by the Coles is unknown. More likely, Capt. Lee needed the Coles to settle part of his Kentucky survey and released the Coles from their leasehold obligations. Capt. 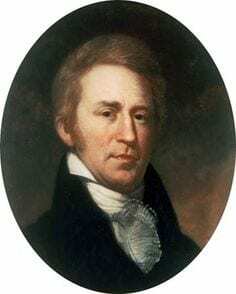 Lee surveyed land in Kentucky beginning in 1773. His son, Maj. Lee, also surveyed in Kentucky with his cousin Willis Lee. Father and son surveyed in and around today’s Midway, Kentucky on behalf of the Ohio Company of Virginia. The Lee’s company was seeking to replicate a settlement colony, the kind William Penn did in founding the Commonwealth of Pennsylvania. To claim Kentucky land, the Lees needed to establish permanent settlers on their new surveys. 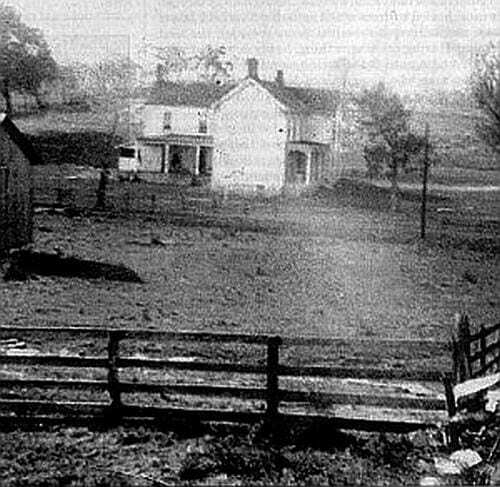 On the Lee family’s settlement farmland outside today’s Midway, the Cole family established an ordinary. The pending arrival of future settlers virtually guaranteed the success of their enterprise. The location of the ordinary was ideal, cited equally distant from Frank’s Ford and the new settlement at Fort Lexington, today’s towns of Frankfort and Lexington. The road, which Richard James Cole surveyed for Maj. John Hancock Lee between the two localities bore his name for decades to come as Cole’s Road. Cole was responsible for the maintenance of the road and its supervision. In later time, the developing geography renamed the road as Leestown Pike. Based on its reputation for the clientele it served, Cole’s Tavern over time degenerated in name and reputation. The ordinary’s earliest name of Cole’s Tavern then became Cole’s Bad Tavern. In its final days, the travelers and the public called the place Little Sodom. The former covered bridge connected Little Sodom to the community of Sodom north of Route 421 on Fisher’s Mill Road at South Elkhorn Creek. Cole’s Tavern was a popular center for political meetings. As settlers populated the manufacturing town of Sodom nearby, the tavern also served as a community meeting place. Sodom village was located on Elkhorn Creek. Its businesses included flour and gristmills, hemp and cotton factories, a tannery, a shoe shop, a machine shop, and a storehouse. Decades later, encroaching railroads passed by the community of Sodom. The village, its people, and enterprises disappeared. Foreign visitors, curious about the unusual American scene, were common on the Kentucky frontier. On his return trip from his tourist exploration in the last decade of the 1700s, Fortesquieu Cummings wrote about his experience at Cole’s Bad Tavern, contrasting it to the Lee’s Black Horse Inn. 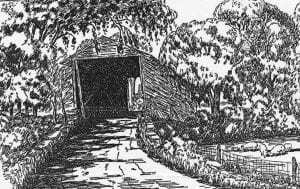 Lee’s Tavern at Nugent Corners – Drawing depicting the original log structure and brick addition, constructed by Maj. Lee, with the toll gate separating Midway from Frankfort. Cummings assessment of Cole’s business stood in stark contrast to Cummings’ prior experience in his former departure from the Dailey-Kennedy Stagecoach Inn, a few miles distant. “After crossing the town branches of Wolf Fork, Steels Run and the South Branch of the Elkhorn River, to which the three former are auxiliaries, we arrived at the hamlet of three or four houses called Leesburg, twelve miles from Lexington. One of the houses had been the seat of the late Col. Lee and is still owned by his widow who rents it to a mulatto man named Dailey, who had converted it into an excellent inn. Nearby Dailey occupied much cultivated land as required to furnish supplies to his well-frequented stables with hay, corn & oats. “There is also a good kitchen garden in which are vast quantities of culinary sweet herbs, besides useful vegetables and he has good stabling and other out offices – for all which he pays only forty pounds per annum. We experienced the benefit of his spacious icehouse. Where everything was good, particularly the coffee which was almost a la Francaise. Before Christmas on December 12 of 1811, Richard James Cole Jr. executed a lease to operate Little Sodom’s classy competitor, Lee’s Tavern. 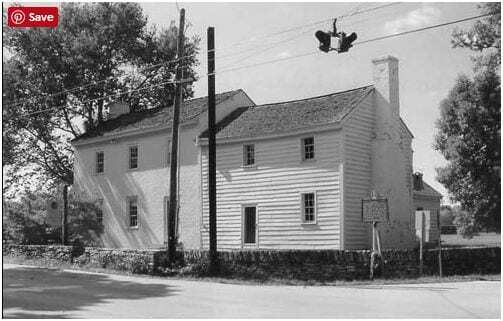 William Dailey and John Kennedy had been operating the inn under the Lee’s name as well as their own. Cole and his wife Sally Yates assumed proprietorship of the place and its business. The excellent reputation carefully cultivated by Dailey and Kennedy now fell into the hands of the Cole family. The inn was rebranded as The Black Horse. Black Horse Inn where the mother of Frank & Jesse James, Zerelda Elizabeth Cole, was born on the second floor, the first window from the left. The earliest survey period of 1773 and1774 identifies the inn’s site as Hancock Taylor’s Station Camp. This was an initial destination for incoming migrants and the meeting camp for surveyors in the Kentucky District. In 1785, during the ownership of Willis Lee and his brother Capt. Hancock Lee, the station developed into a public inn. Two log rooms were constructed. Maj. John Hancock Lee added a two-story brick addition in 1799. 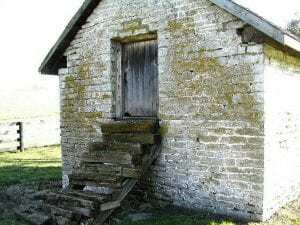 At this point, the building was officially identified as the first stagecoach stop west of the Allegheny Mountains. Here, Maj. Lee died in 1802. John Hancock Lee Jr., who was born in the tavern, divested himself of his family’s business when he executed his lease of the premises to the Coles. The Black Horse Inn where Amos Cole was stabbed to death outside the right front door. 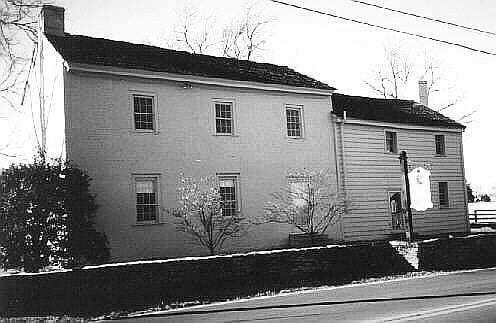 A son of Richard James Cole Jr., named James Cole, assumed the operation of The Black Horse with his wife Sarah Lindsay, a granddaughter of Anthony Lindsay Jr. who arrived in the Cain-tuc with his wife Rachel Dorsey in 1784, about the same time as John M. James entered the District. Lindsay promptly constructed Lindsay’s Station. On January 29 of 1825, Sally Lindsay Cole gave birth to Zerelda Elizabeth Cole, the future mother of Frank and Jesse James. Zerelda was born in the upstairs brick addition that often converted into a swanky ballroom. when an entire wall was lifted, much like a garage door of today, to create the needed space. 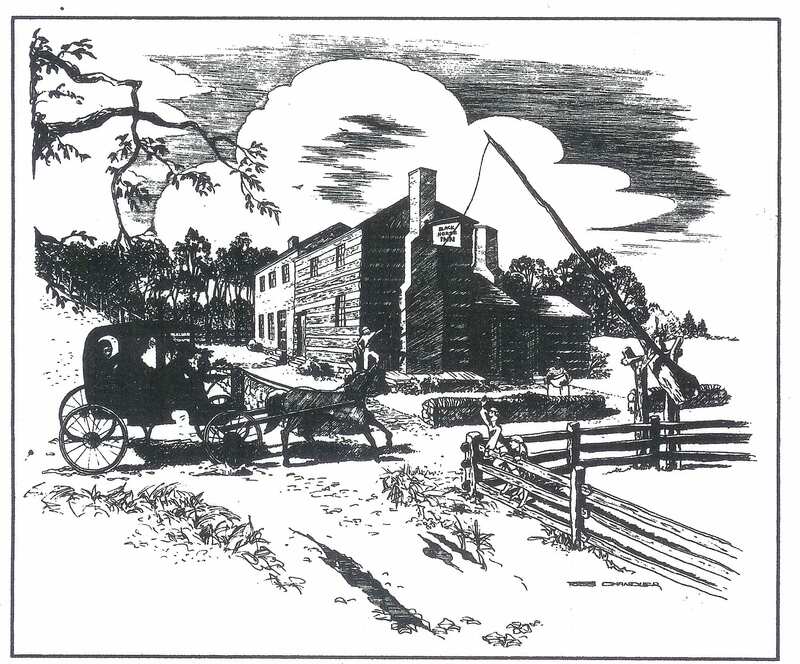 Two years later on May 12, the reputation of the Black Horse Inn was irreparably stigmatized by the Cole family. Young Zerelda’s uncle Amos Cole was stabbed and killed at the inn. Two men, named R. Taylor and Mr. Gallaspie, arrived at the inn in the evening. They were intent on creating trouble for the Coles. A knife fight ensued with Amos. The struggle spilled outside the front door. When Amos was mortally wounded, he was taken inside. Amos was laid before the fireplace of the upstairs room in the old log building. His blood stains remain embedded in the floor and unremovable to this day, indelibly marking his demise. It is the only evident memorial of Amos Cole. 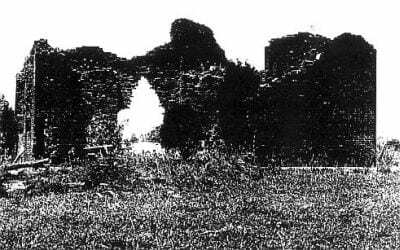 Following the death of her uncle, Zerelda and her brother Jesse Richard Cole were sent to live with their grandparents Richard James Cole Jr. and Sally Yates at Little Sodom. For the next ten years, young Zerelda was witness to every kind of high life and low life imaginable, from horse thieves and murderers to politicians and international diplomats. When her grandparents died, Zerelda was sent to live with her uncle Judge James Madison Lindsay at his home in Stamping Ground. When Judge Lindsay found her too much of a handful, he sent her to be disciplined by the Catholic nuns of St. Catherine’s Academy in Lexington. Zerelda escaped by marrying Rev. Robert Sallee James before the fireplace of Judge Lindsay’s parlor; but not before her Christmas wedding was delayed as a wedding guest caught ill, lingered for three days while everyone waited, and died in the room above the wedding couple’s heads. Jesse Richard Cole 1826-1895, brother of Zerelda Cole. 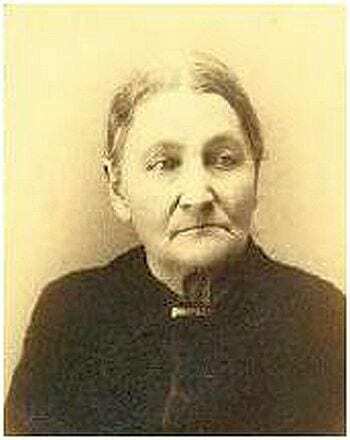 The Cole family’s first need of a burial site in Kentucky occurred in 1795 when Ann Hubbard-Cole died on February 11. 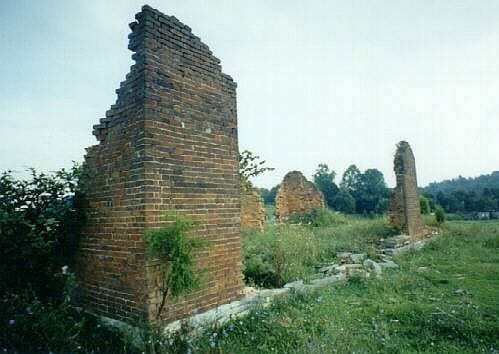 She and her husband, Richard James Cole Sr., had moved to the area of Midway, Kentucky in 1782. Richard died on November 21 of 1814 and was buried with Ann. 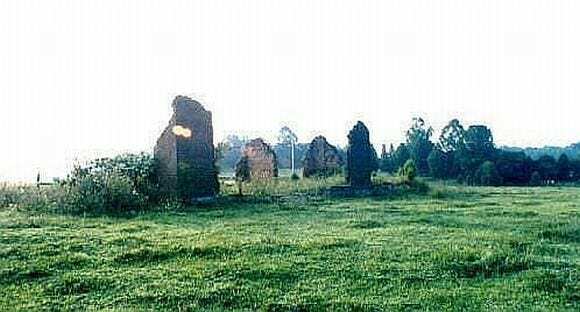 It is known that other burials occurred with them on the farmland set aside as the Cole Cemetery. 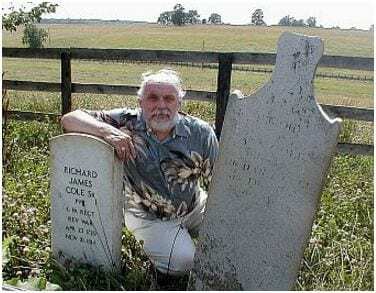 No documentation exists to account who is buried with Richard James and Anne Hubbard-Cole, although it is believed to be principally their descendants and their enslaved. A reasonable assumption is that at least one child of the couple is buried with them. Richard James Cole Jr. died on July 9 in 1839. 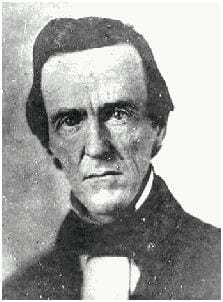 Most certainly, he would have been buried with his parents and his wife Sally Yates who predeceased him on November 8 of 1836. Other siblings of Richard James Cole Jr. would have been buried by their in-law spouses in separate burial grounds located on their separate farms elsewhere. The children of Richard James Cole Jr and Sally Yates most likely rest with their grandparents, too. William Yates Cole died in 1823 at the age of thirty-five. His is the earliest burial after his grandparents. Following his murder, Amos Cole was likely buried in Cole Cemetery. His widow, Elizabeth Hynes Cole, a first cousin of the same surname, quickly remarried. Three months after the murder of Amos, his brother James Cole was thrown from a horse and died. At the height of a cholera epidemic when a mass exodus departed Kentucky for Missouri on religious missions and escape from the disease, Jesse Cole died on August 3, 1833, at the age of forty. He left a widow, Fanny Rice, and a young child. Fanny also quickly remarried. All of these Cole family members likely rest in Cole Cemetery without markers. Due to customs of the time, the enslaved and servants of the Cole family were interred at Cole Cemetery, too. Five Springs Farm, owned by Jim & Mary Nuckols, Rte. 421 at the intersection of Fisher’s Mill Rd. Andrew Jackson “A. 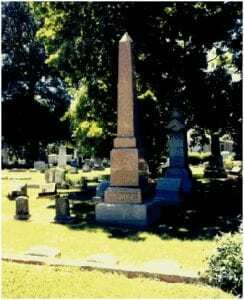 J.” James will be highlighted in the upcoming cemetery tour of historic Frankfort Cemetery. This cousin of Frank & Jesse James left his mark on Kentucky’s capitol city as a State Legislator, State Attorney General, Kentucky Secretary of State, elector for Martin VanBuren, a Democratic nominee for Governor, Mayor of Frankfort, and president of Frankfort’s Farmer’s Bank. Despite A.J.’s former inheritance and ownership of twenty enslaved people, and his passage of legislation governing enslaved populations prior to the Civil War, A. J. often brought cases late in his legal career after the war, representing blacks before the Franklin County court. Frankfort Cemetery is the final resting place of many Kentucky founders and political elite. A. J.’s burial site is steps from the grave of Daniel Boone. Russ Hatter will be hosting this cemetery tour. Hatter is a personal friend of the James family. Hatter also is an archivist at the Capital City Museum in Frankfort and a co-author of Frankfort Cemetery, the Westminster Abbey of Kentucky, and A Walking Tour of Historian Frankfort, among other books. This is the second year Hatter will be conducting his popular tour. This year’s tour will encompass 80 graveside presentations. Hatter’s tours of Frankfort are very popular attractions both for locals and tourists, as well as Hatter’s appearances in historical plays and re-enactments. It is rumoured that the Jesse James family historian and genealogist Eric F. James will join Russ Hatter at the burial plot for A.J. James. Rumour has it that the Jesse James family historian and genealogist Eric F. James may join Russ Hatter at the burial plot for A.J. James. A mystery has surrounded the death and burial of John Jarrette, a Quantrill Raider, and James Gang member. Researcher Lorna Mitchell has been on Jarrette’s trail. Attempting to solve the mystery, Lorna has produced documents, expected to write some new history, plus a grave marker for John Jarette. An unsubstantiated story of death claims that John and his wife Mary Josephine Younger, known as Josie, a sister of the Younger brothers, perished in an ambush of their home in St. Clair County, Missouri in 1869. 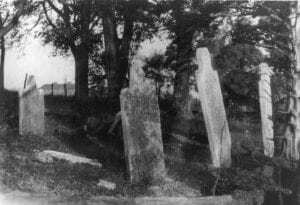 Local lore said John and Josie Jarette were buried in Yeater Cemetery in Roscoe, Missouri. 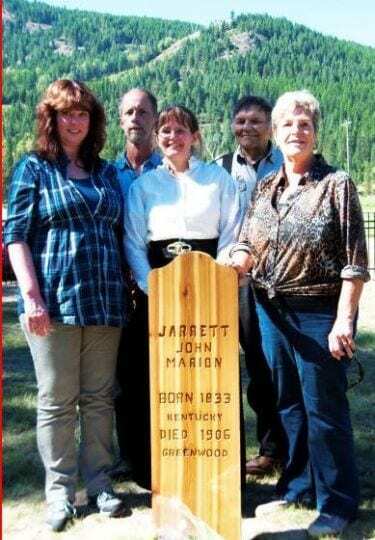 The Jarette’s children Jeptha and Margaret, were adopted following their parent’s demise. Genealogy records of William R. Lunceford in 2005 stated Anne and Lycurgus Jones became legal guardians of Jeptha Jarette. Nothing is known of who adopted Margaret. 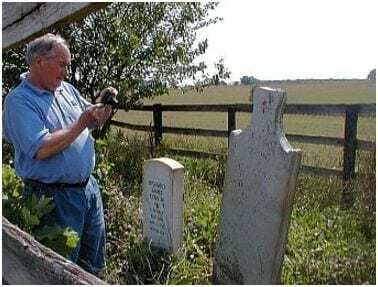 No cemetery records exist for Yeater Cemetery and a physical inspection of the cemetery revealed tombstones too old and weathered to be discernable. Lorna Mitchell has tracked down John Jarette to Greenwood in British Columbia, Canada. 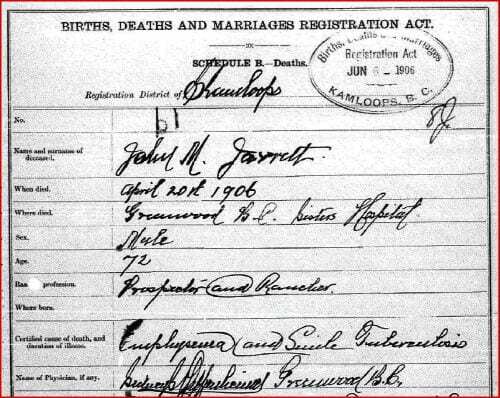 She’s produced a death certificate showing Jarette, a proprietor and rancher, died in a local hospital in 1906. 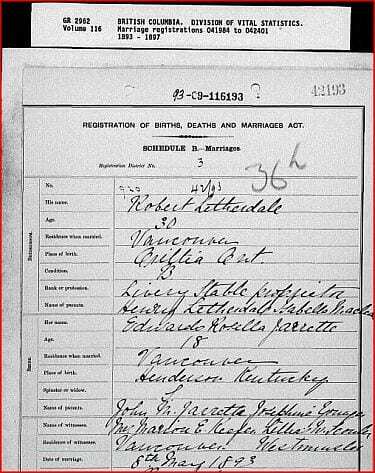 A marriage certificate also has been produced by Lorna, showing a marriage between Robert Letherdale, a livery proprietor, age 30, and Edwards Rosella Jarette, age 18. Edna, as she was known, is identified as being born in Henderson County, Kentucky with her parents identified as John Jarette and Josephine Younger. The couple was married in 1893. The marriage certificate for another daughter, Marion Jarette, the spouse of Hugh F. Keefer, also shows John and Josie Jarette as Marion’s parents. 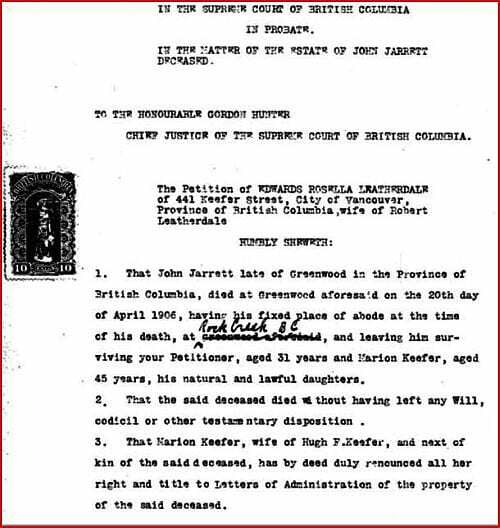 Both daughter petitioned the British Columbia Probate Court, with Marion relinquishing any claim. In addition to these documents, Lorna states she has an archive of supportive documents, records, and newspaper clippings. Whenever an important discovery, such as this, is made, new questions arise. We expect Lorna will be moving on to the next step of investigation, namely researching how, why, and when Jarrette went to Canada and what was Josie’s fate and where. Of course, people are going to inquire, too, about the middle initial “M” in her documents and where that comes from, since a middle initial for John Jarette was unknown previously. A couple years discrepancy in Jarette’s birth date can be expected to be called into question also. But a specific date may not be as important as the hopeful discovery of John Jarette’s life in retirement from the James Gang and Quantrill Raiders. Lorna Mitchell provides the excellent example of how genealogical research will provide historical breakthroughs. Traditional historians should take note. More due diligence of this type should be conducted by genealogists and historians. We look forward to more of Lorna’s fine research. Lorna Mitchell is opening a new door to new history. This is one of five historic homes of our James family in Pulaski County, Kentucky. Located at the intersection of Route 80 and James Road, the site is about eight miles east of Somerset, Kentucky. Unclear is whether this home was built by John M. James (1751-1823), or by his son, Reverend Daniel Field James (1795-1871). I believe it was John. 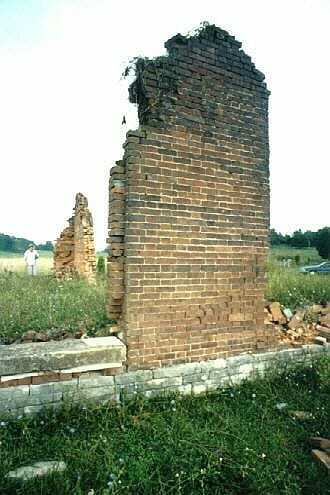 Daniel built his own brick home on Highway 461, north of Dahl Road. John’s previous brick home was built at the bend in Dahl Road, circa 1795. This second home was more opulent in its construction with arched windows and doorways, and much larger in size than John’s first home. This home definitely was occupied by two of John’s daughters and their husbands. John’s third eldest daughter, Betsy, lived here with her husband, Reverend Jeremiah Vardeman. After she eloped with Jerry, John brought the un-godlike Jerry into Baptist ministry. Jerry went on to become an eminent Baptist Divine. Jeremiah Vardeman founded the schools of Theology at Georgetown College in Kentucky, and at William Jewell College in Missouri. He also gave Frank and Jesse’s father, Reverend Robert Sallee James, $20,000 to become a William Jewell College founder, after Robert graduated Georgetown. Record books today identify this tract as “The Vardeman Tract.” Jerry’s enslaved were buried in a cemetery on this site. Jerry also had a still in the knob behind the cemetery meadow. John’s eldest daughter, Molly, subsequently occupied this home with Senator Jack Griffin Sr. The home then was occupied by Will James, John’s grandson and a son of Daniel Field James, with his wife Nancy R. Gilliland. Will, it is said, got shot up riding with Frank and Jesse. Will returned to this home partially crippled. The estate sits in clear view of James cemetery, on the knob diagonally across Route 80 at the end of James Road. It was Jack Griffin’s son, Senator Jack Griffin Jr., who accidentally burned down the house. This photo shows the markings of the fire that consumed the second story bedroom level. Today, all the bricks are gone. The leveled site is planned as an interchange for the extension of historic Route 66. A gravel pit consumed the former slave cemetery onsite. The Commonwealth of Kentucky avoiding any necessary cemetery mitigation for the enslaved. The Commonwealth also determined the home itself not to be worthy of an archeological excavation. Soon the site will become a road interchange, unless the present delay in construction, caused by the collapse of the national economy, persists anbd national transportation funds are withheld. We pray to John, Jerry, Daniel, Will, to all their wives, and to all their enslaved, that the history of Route 66 never paves over the history of our James family.